A prototype flying car that supposedly does the job of both a helicopter and a truck went up for sale on eBay a few days before Halloween. That privately-developed AT Black Knight Transformer represents a vision of the flying car future that has seemingly fallen out of favor as new startups in Silicon Valley and elsewhere pursue the idea of flying cars without wheels. But flying car enthusiasts or companies with specialized missions in mind may still find something to admire in the Black Knight Transformer’s hybrid flying car design. The aerospace startup called Advanced Tactics had U.S. military missions in mind when it first began developing the Black Knight Transformer. U.S. military research agencies were sponsoring design competitions that evoked visions of a Humvee capable of taking flight like a flying car from “Blade Runner” or “Back to the Future.” That military flying car fantasy fit neatly with past science fiction stories about vehicles capable of transforming from driving on wheels to going airborne within a matter of seconds. It was supposed to be the best of both worlds that could give troops the flexibility to infiltrate enemy lines and evacuate wounded comrades from war zones. In that spirit, the U.S. Air Force Research Laboratory awarded a contract to Advanced Tactics under a Special Ops Transport Challenge in 2012. 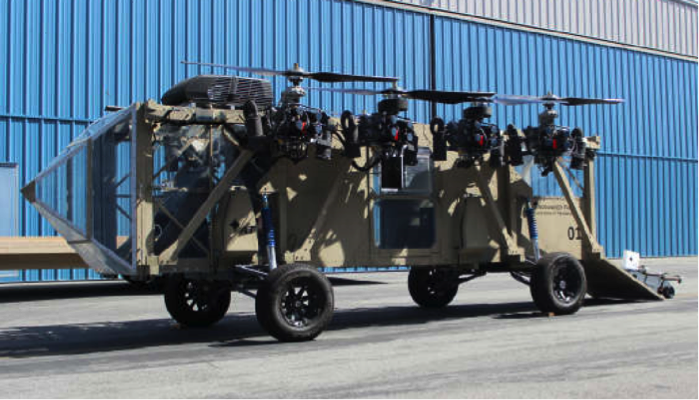 Advanced Tactics went on to build its Black Knight Transformer with eight aircraft engines and propellers enabling vertical takeoff and landing (VTOL) flight tests. In addition, the Black Knight Transformer prototype has four wheels and a ground mobility powertrain for driving at speeds of up to 70 miles per hour. But recent years have seen a shift away from those original visions of a flying car future filled with vehicles transitioning seamlessly between land and air. A flying car challenge sponsored by the U.S. Defense Advanced Research Projects Agency yielded a finalist from aerospace giant Lockheed Martin that resembles more of an oversized flying drone capable of picking up separate wheeled vehicles. Even Advanced Tactics seems to have shifted its sights by putting its Black Knight Transformer up for auction on eBay. The startup’s press release states that the eBay auction—scheduled to end on November 2—will help fund development of a new flying car concept, called AT Transporter, that leaves wheels behind in favor of helicopter-style drone operations. The robotic AT Transporter would carry pods slung under its belly that could hold between three or six people, cargo for disaster relief or resupply missions, or even wounded people on stretchers. A similar shift in visions of the flying car future has taken place among startups focused on the civilian market. Granted, startups such as Terrafugia and Aeromobil have developed and even flown flying car prototypes known as “roadable aircraft” that resemble light aircraft capable of folding up their wings and driving on roads. But such vehicles seem unlikely to gain serious traction beyond licensed pilots of light aircraft. By comparison, a slew of recent Silicon Valley startups such as Aero and Kittyhawk—backed by Google cofounder Larry Page—and tech giants such as Uber have laid out a different flying car future that envisions passengers using apps to hail automated air taxis without wheels.